I’m recreating this comfort food classic from your childhood that is nutrient dense, filling, and will have you coming back for more! Ditch the jelly with added natural and artificial sugar and skip the nut butter that hides some trans fats, tropical oils, and sugar. Looking for another twist? Try adding some yogurt (like Siggi’s Dairy or Greek yogurt) underneath fro a tangy protein probiotic punch (points for alliteration?). Tag your toast on Instagram using @eats2know so I can see your creations! I just came by to check out your blog Dana! 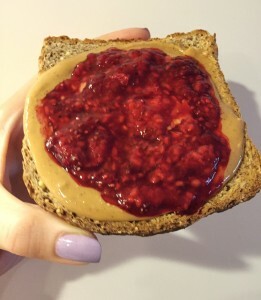 That looks like a ‘superfood’ pb&j toast. YUMMMY! Thanks for stopping by. Great to have you here, Emily!